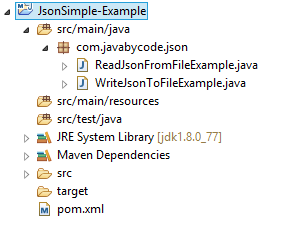 JSON Simple example show you how to use JSON.simple Java library for reading and writing JSON data into a file. JSON.simple, is a simple Java library for JSON processing and full compliance with JSON specification (RFC4627). In this tutorial, we show you how to use JSON.simple to read and write JSON data from / to a file. In this example, it initializes data via JSONObject and JSONArray. Then save it into a file named “test.json” that is placed in the directory “E:\tmp”. Noticed that if you want to convert object to / from JSON, you should consider Jackson or Gson. That’t it on the JSON Simple example tutorial. will certainly digg it and individually suggest to my friends.